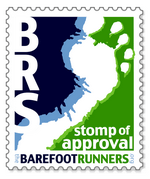 Having been part of this whole “barefoot” and “minimalist” running world for a few years now, and having seen it change and grow, I have come to know a lot about the innovators and entrepreneurs who have brought so much to it for so many people. 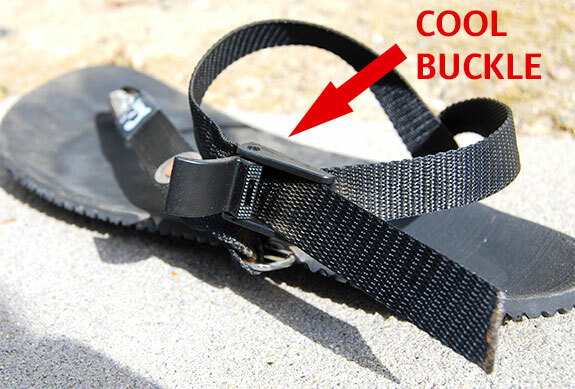 One of those innovators is the Luna Sandals company. Powered by some of the most fun-loving, kind and down to earth people you could ever meet [at the Born to Run Ultra], Luna Sandals is as much a culture as it is a company. How great would it be to work for such a place! It’s sadly just so rare these days to find a company that is just as good at professionalism and quality as it is at having fun and being passionate about the same things their customers are. Luna has this and I find it totally refreshing. This is one of the biggest reasons why I love to support and promote them and their products. The other reason is that I really love their sandals, guys! Last year I got the opportunity to review their original suede-covered sandal (renamed “Venado”) with the ATS laces that had just come out. Once I wore those babies in they became my only piece of footwear during the summer. I wore them for the 3,000 miles from Boston to San Diego when we made our big move. I ran, hiked, climbed and lived in them so much that the foot bed now has a fine patina and they have a fit so perfect that it would charm the likes of Cinderella. Last year’s Venado – beautifully worn in. The only place I didn’t love my Luna Venados was when I ran up steep hills, which is a frequent occurrence for me around here. The tread on the soles was pretty flat and didn’t hold on to the ground as well as I liked, especially after building in some wear. So when I saw the new Mono food bed (pronounced “moe-no”, and is Spanish for “monkey”), I thought it might be a good alternative for the trails. Much thanks to the generous Lunar Monkeys, I was able to snag a pair cut down to the shape of my foot, and this time I decided to try some tie laces rather than the ATS. Instead of suede like in my Venado footbed, the sole of my Mono is covered in Pittard’s leather. This is supposed to be a more premium material than the suede, and less slippery in wet conditions. I found the leather to be comfortable and yes, seemed to have a better traction to my foot when wet. But the leather doesn’t get that nice form-fitting wear-in that makes my Venados feel so special. At least not yet, anyway. That could be due in part to the thickness of the sole (12mm as opposed to the Venado, which I think is 6mm), which turns out has its own list of considerations. Because the sole’s rubber is so thick, the toe and ankle holes are able to be counter-sunk, which means they dug into the sole a bit so that the laces don’t rub against the ground. This is a definite plus for the life of your laces. The sole of the Mono has some tread, so the traction is much better than the Venado for trail, although not as rugged as the Leadville (their recommended trail sandal). The Mono is more of an all-terrain sandal, which works for someone like me who is just as likely to wear them to the farmer’s market as I am to bring them on trail. These photos shoe the sunken-in laces and toe plug. And speaking of trails: I actually found myself running some trails in this shoe, especially when paired with the right laces (more on that later). The extra oomph of the footbed gives me just a little more traction – not enough to run down Torrey Pines Gliderport, most likely, but it works. The only negative I experienced is the thickness of the foot bed. It’s 12mm. That’s thick enough to keep me from feeling the ground. Most people don’t have the ankle problem that I do, but if I can’t feel the subtle ground changes below me, I lose proprioception, and thus I lose the reaction time I need to prevent twisted ankles. So unfortunately I’m not really sure how much trail running I’ll do in these sandals, and I may consider purchasing a pair of Leadville Pacers for their rugged traction and thinner sole, and then have the full array of Luna sandals to meet my running needs. 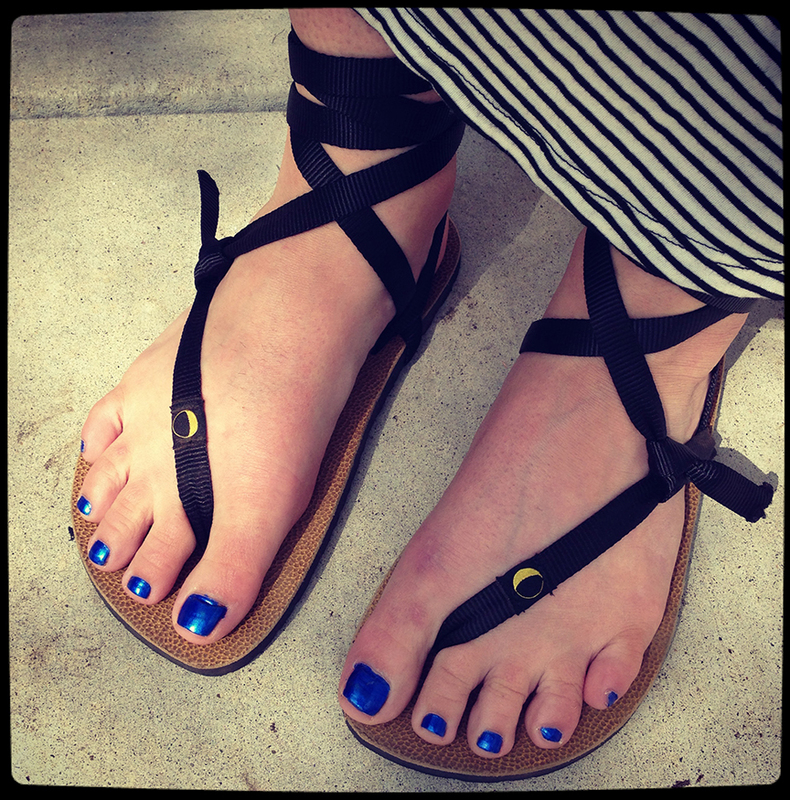 Your choice of lacing is probably the most personal, make-it-or-break-it aspect of any Luna Sandal. There’s the no-fuss ATS lacing, the ¼” or 10mm leather laces, traditional hemp laces, and new to the game, the ribbon laces (currently offered in black and blue). I requested the tying laces as opposed to the more popular ATS laces this time around because I really love the way they look all wrapped around my foot and ankle – I find it pretty and stylish. I got my Monos before the ribbon laces were available. So when my pair came in they had a set of 10mm laces, the thicker leather that they offer. I don’t actually know why I chose the 10mm (or even if I did), but I wasn’t a fan. They were so thick and unflexible that I couldn’t get them to stay tied. They literally fell off my feet while I walked. Perhaps the ¼” laces would have made me happier. However, once I saw a few photos of sandals with the new ribbon lacing, I had to snag a set for myself (and at $12, they weren’t too much of a risk). My feet up on the dashboard in the 10mm leather laces. And my gosh what a world of difference! The ribbon laces may or may not be as long-lasting as the leather ones (this remains to be seen) but I very much prefer the plush, pliable fabric of the ribbon (which is sort of like a much softer version of a backpack or seatbelt strap). Used to be I always stuck with the pre-tied huarache because traditional tied laces tend to slide right off my heels. 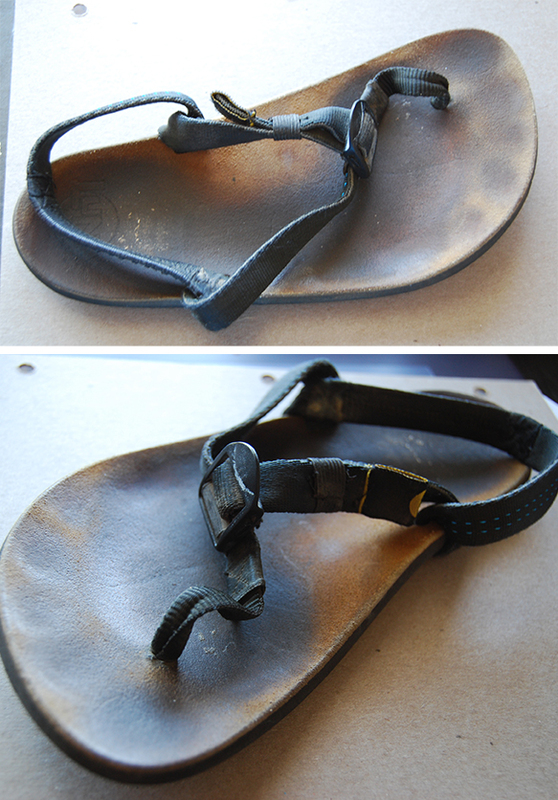 Doesn’t matter how tight or loose I tie the things, the heel strap just doesn’t stay put. But because the ribbon lacing is so workable, I was able to find my own tying method (see below) that keeps the shoe in place permanently. For the first time, my feet are comfortable, there is no rubbing, and I don’t have to adjust or retie…ever. This tying method has worked so well for me that I even prefer it over the ATS lacing, and the new ribbon is so perfect that it makes any Luna sandal the most comfortable huarache you’ll ever put on your feet. Yeah, I said it. For the first time ever I can actually see myself comfortably running a distance race in a pair of sandals. The tying method for those with flat heels: loop the lace once under the heel strap, and it doesn’t budge. Overall, I dig the Mono and I know I will wear it a lot. 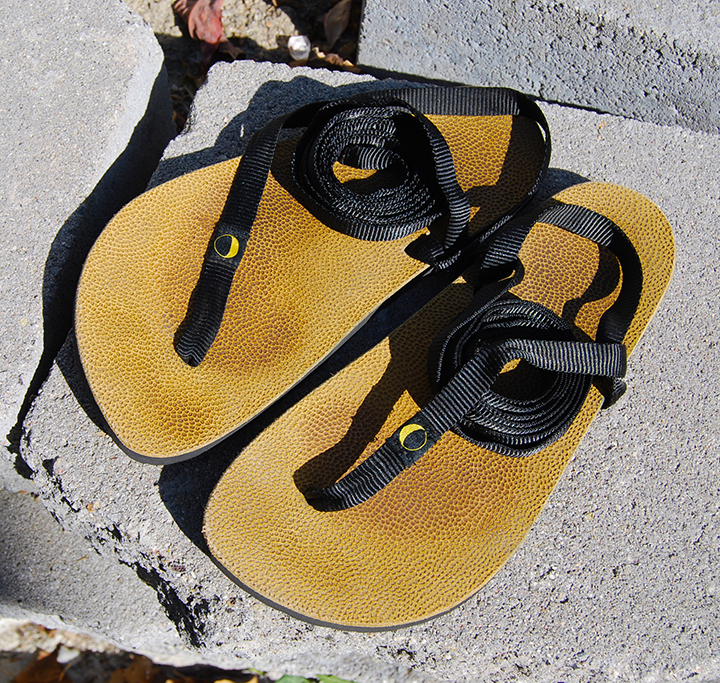 I miss the suede footbed, but I think I’ll get used to the Pittard’s leather and eventually see the up-sides of it. I probably won’t be spending a lot of time running trail in the Mono because of its thick sole, but I can see myself tying them on for a road run on a hot day or for some hiking with my dog. I will probably wear them everywhere I go this summer, however. I love the way they look and feel with the ribbon lacing, especially now that I have the tying part down. 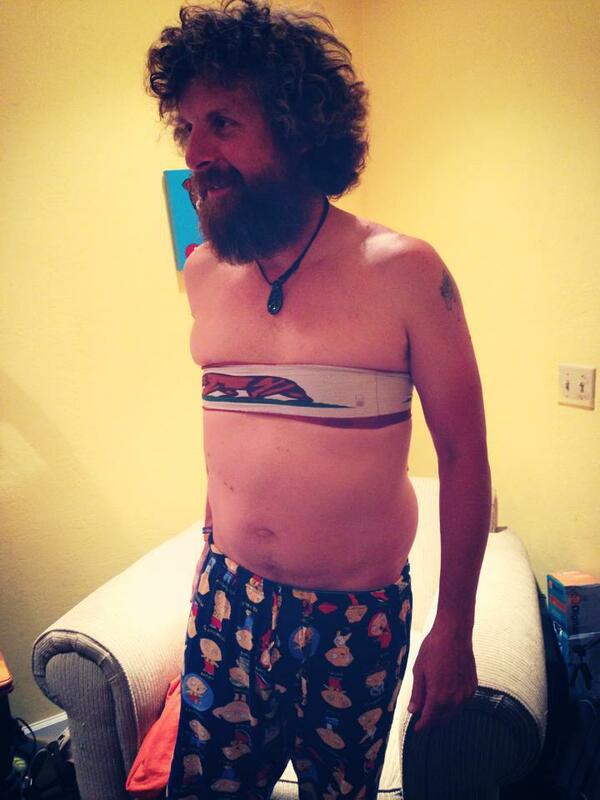 They are exceedingly comfortable, secure and even fashionable. If you’re looking for the all-terrain, super comfortable huarache shoe that has a little more sole protection, this is your Luna. If you don’t have a problem with thicker soles on easy trails (or prefer it), you’ll love wearing the Mono on the trail as much as on the road. But if you’re hoping for a sandal with amazing traction and don’t care about the leather footbed, go for the Leadville (12mm thick sole) or Leadville Pacer (9mm) instead. Either way, I highly recommend the new ribbon laces for their versatility, adjustability, stability and comfort. They’re just a total win. 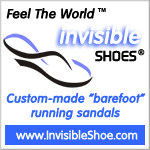 Categories: natural running, product reviews | Tags: huaraches, Luna, Luna Sandal, mono, ribbon lace, Sandal | Permalink.